All of the walls at the collectors market are covered in art from around the world and from New Zealand. We stock a lot of New Zealand modern art, water colours, old oils, abstracts and still lives. We have all different shapes and sizes. I’m sure we will have something that will look good at your house. 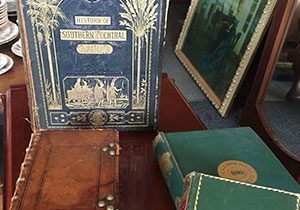 We have thousands of antique books and reference picture books so unleash the bookworm and come and have a look at all the rare books. So if you’re looking for antique kids books, antique bibles or a good old storybook come have a browse in our library. Yes, we have a number of antique bottles from New Zealand and all over the world. We have antique beer bottles, antique ginger beer bottles, sort drink bottles and heaps more. So come and see for your self. Carvings and artifacts are a personal favorite of mine. I love the skill and time that the native people have put into their artworks. We have artworks from all over the Pacific, Asia, Africa, Europe and South America. 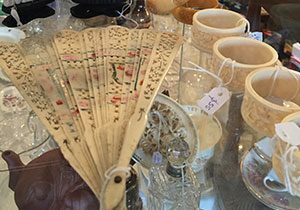 Here at the Avondale antique and collectors market there is the largest collection of china in the country. 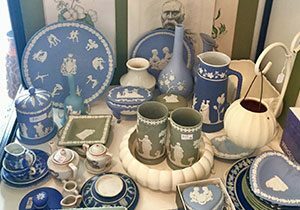 There is china of the finest quality and the biggest brand such as Shelley, Clarice Cliff, Moorcroft, Lladro, Royal Doulton, Wedgwood, Royal Albert and our own Crown Lynn. 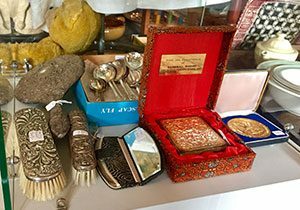 We have a lot of Chinese antiques and antiques from all over Asia. 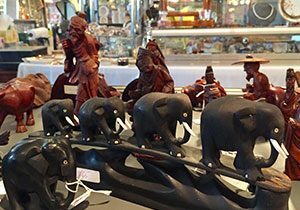 We have hand carved Chinese ivory, hand-painted ceramics, Chinese silk embroidery, jade carvings and much more. 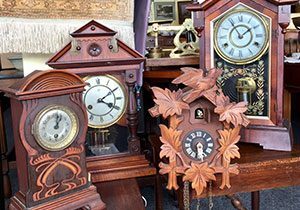 If you are looking for an antique clock or pocket watch look no further we have both as well as lady’s and men’s wristwatches. We have mantle clocks, grandfather clocks and cookoo clocks. We have clocks and watches from all over the world. Do you like beautifully hand cut crystal? Nothing tasted better than wine or whisky out of a crystal glass, or looks better than a crystal vase full of flowers. 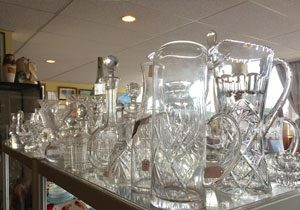 So for all the crystal you could ever want at wholesale prices we are the place to go. With Webb and Corbett crystal, Stuart crystal, Waterford crystal and heaps more. 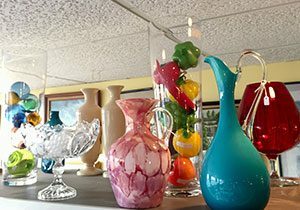 We also have some of the funkiest art glass you will ever see from bright coloured bowls and vases to hand blown lady’s, animals and gumboots. 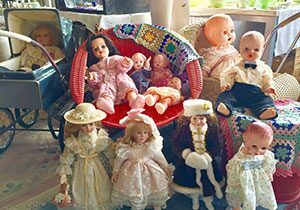 Yes, we have antique dolls, doll prams, china dolls, antique teddy bears and lots of antique toys. There is a huge space just dedicated to antique furniture. 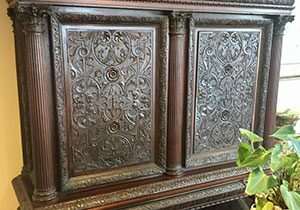 There is furniture from the 1600s all the way through to 1970s. Dining tables and chairs, side boards, scotch chest, china cabinets, sideboards, book shelves, lounge suits, coffee tables and much more. Jewellery, gold jewellery , silver jewellery, vintage jewellery and costume jewellery . We have a specialist jewellery stand at the market with a big range of rings, chains and bracelets. 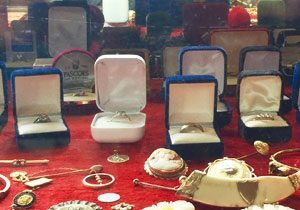 So if you’re looking for a diamond engagement ring, vintage fob chain or an old cameo broche, come and see us – we can find you what you are looking for. 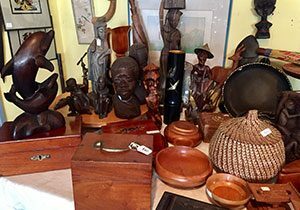 If you’re a kiwi, then you will have a special connection to old New Zealand antiques. It’s a neat thing to be able to show the next generation how things used to be back in the day. 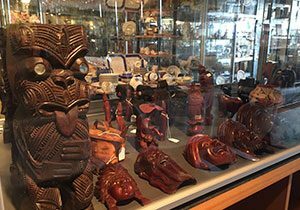 New Zealand artifacts and Kiwiana is always a fast seller. But we are always finding new items so you need to come every month to see what we have. Big tiki posts to pieces of kauri gum, blocks of greenstone, Maori adses, Maori carvings, and greenstone jewelry. 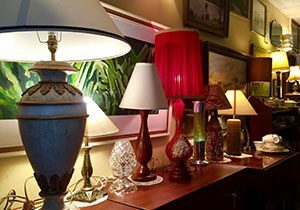 Antique lamps and light shades are a fantastic way to make your house look timeless and create an ambiance. So if you’re looking for a groovy lamp, deco light shade, crystal chandelier or something a bit different come in and have a look. 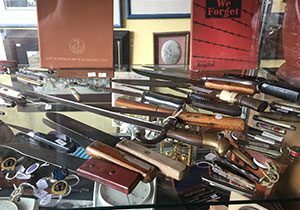 At the antique and collectors market, we are always getting new military medals, bayonets, badges, weapons, and uniforms but they sell fast so come in and see us and we can find what you are looking for. If you are like me then you love the style of something retro or art deco. Why would you buy a cheap knockoff when you can by the real thing for the same price? So if you’re looking for anything from a retro lamp, art deco sideboard, retro coffee table or maybe some stylish retro or art deco clothes – you will love our selection. 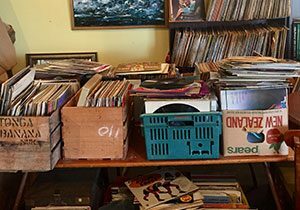 At the Avondale collector’s and antique market, we have over 10,000 records. With all types of music from rock, pop, jazz, classical, r&b and heaps more. We also have a range of musical instruments. 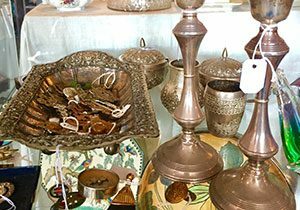 Yes, we have it all at the antique and collectors market from knotted Persian rugs, hand made Chinese silk rugs, European retro rugs and more hand made rugs from all over the world so come in and have a look. We have heaps of silverware from all over the world. We have sterling silver from England and all over the UK as well as silver from all over the world. So if you’re looking for some silverware to use or something that is a beautifully handmade piece of art for the mantle piece, it’s here at the antique and collector market in Avondale. How cool does a stuffed animal look in the man-cave?! 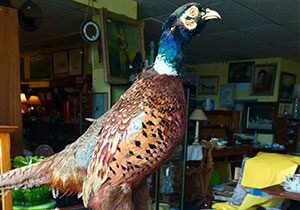 We get animals from all over the world from wart hogs, crocodiles, ducks and fish so when you want something cool for the wall come in and have a look. 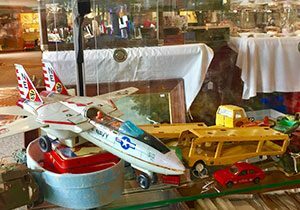 Antique toys are a really cool thing to collect and we have heap at the antique and collectors market. Fun Ho, Dinky, Corgi, Hornby as well of lot more. We know the style and quality of vintage electrical is hard to beat. So at the Avondale antique and collectors market we have a special stall just for vintage cameras, antique radios or a vintage lighter. Want something trendy for you next trip overseas? Or maybe a nice wooden trunk for storage. 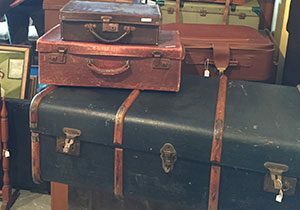 Old trunks have a lot more character. Like the man in the photo so come in and let Tom find the right trunk for you. 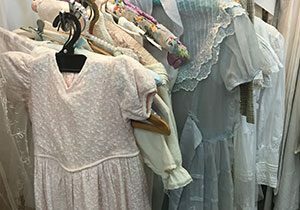 There is a store at the Avondale collector’s market dedicated to vintage textile and clothing. With handmade leather, fur coats, Oroton wear, hand-embroidered dresses, tablecloths and heaps more.